Everything about this pic reminds me of growing up in California in the 70’s I think I spent a lot of the early 70’s in a poncho knit by my grandma that looked a lot like this bold striped chunky sweater. And I know I spend hours of every summer at the Santa Cruz Beach Boardwalk. It’s been so fun and relaxing having a bit of a staycation with my husband over the holidays. One day I was craving some ocean air and clam chowder, so we went to Santa Cruz for lunch. I’m wearing this bold striped chunky sweater from Shein (c/o), with my go-to Old Navy jeans, Topshop sneakers , Soft Surroundings sunnies (c/o), Kendra Scott Lacy earrings, and my Rebecca Minkoff crossbody bag. It’s a fun, easy outfit that seems to be looking forward to springtime! One of my fav outfit from last week’s link up is this chic look Funky Forty. Yvonne is rocking that baker boy cap and looks so sophisticated and polished! On the blog this week, I have my list of tips for a successful closet cleanout! Please feel free to add any others ideas and tips in the comments section. Don’t forget to link up and share your style. Hope your 2018 is off to an AMAZING start! Bold, Beautiful and you are a BABE! I love it! Happy New Year gorgeous! Oh I just love this look! I have been wanting a striped colorful sweater and those shoes are just perfect for this look! Dawn Lucy, this is perfectly adorable! I love all the bright colors in your outfit and your surroundings! My surroundings are currently gray and white, covered in snow and slush which will probably not melt until May at the rate we are going. I think I need a vacation to sunny California! I will let you know if I start heading west! I can’t believe how well your sneakers match one of the stripes in your sweater – perfect! I love Old Navy denim – all my favorite jeans are coming from them lately! I love Old Navy denim too … just so wearable! So glad I thought to pull out these sneakers with this sweater! Thanks so much for stopping by, Kellyann! Happy New Year. Glad you loved your staycation. Sometimes it is right that what one needs as a vacation is involved with some stress too. Yes for sure … traveling is exciting and fun, but also there is some stress involved! I love how some of the newer things remind us of years gone by!! I saw that sweater on the site and wanted it because it reminded me of my own knitting adventures……long time ago! It s fabulous sweater! Great look for a seaside excursion. You’re so right about it having classic 70’s retro elements and it’s still fresh and modern. You look fabulous. Thanks for the link up and I hope you have a wonderful weekend. Thanks so much for the sweet comment, Rena! Happy new year! Your pic are fabulous. I like your style – in Germany we have a Little Winter Wonderland. I bet it’s gorgeous there, Martina! Love the joyful colors, Dawn! Thanks for the linkup and Happy New Year! Beautiful, fun sweater! I just love the bright and bold colors of it! This makes me want to travel. I and think your sweater and shoe combo is so fun!! Most of my week is casual so I love ideas for more looks. I love a casual look! It really fits my lifestyle best too! 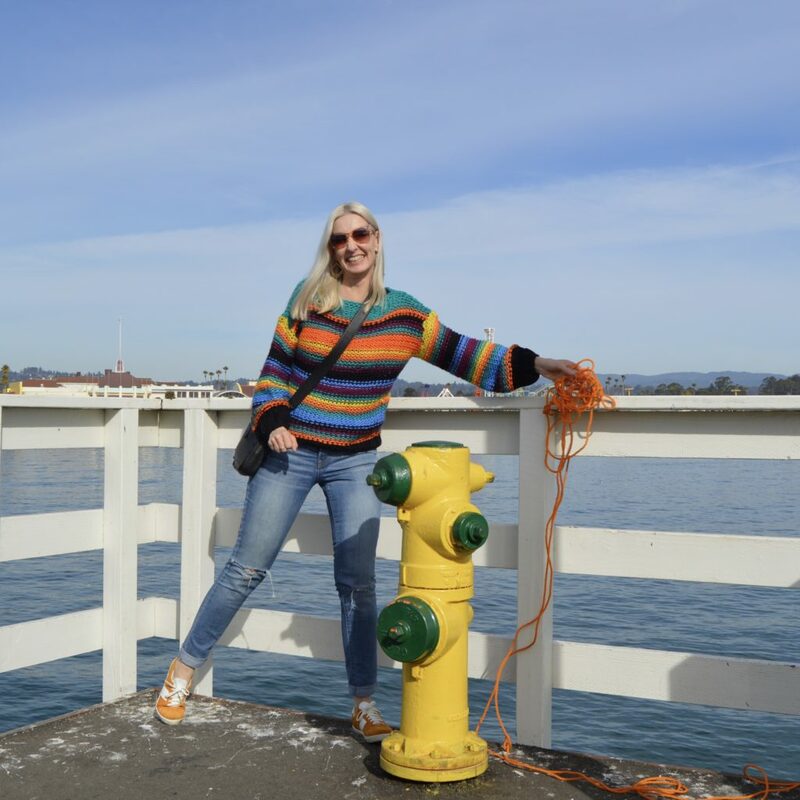 Love the colors in your sweater, a retro vibe and those sneakers are so cute! sounds like the perfect getaway for awhile. I love the sweater…the colors are so happy! And the shots are simply gorgeous. Happy New Year my friend! I love that rainbow sweater and that it is a chunky knit. Fabulous neon sneakers too. I bet growing up in California was a lot of fun! Happy New Year Fabulous Dawn Lucy and come join my recent Thursday Moda with your wonderful stylish looks! Love this casual look. It’s so chic and vibrant. Aren’t we lucky to live in a place where we can go jacketless in January?! Fun sweater, and happy new year to you! love your outfit!!! The stripes so colorful and fun! Happy New Year, Dawn Lucy !!! I have lived in California my entire life, and couldn’t imagine living anywhere else!! I grew up in San Diego and have now lived in Huntington Beach for almost 30 years. Time flies. I love your blog and get a lot of inspiration from you. OMG thanks so much for featuring me Dawn – such a sweetie!!! Loving that sweater on you. If I had to have one New Years goal it would be to go to NY this year and meet you and a few other bloggers in person… was thinking of planning a trip for the Sept Fashion week? What do you think? Happy New Year Dawn. Lovely outfit, love your jumper. This is such a great colourful outfit that reminds me of summer! That sweater is perfect! I love the bold colors and paired with those tennis shoes it’s a great outfit of color!